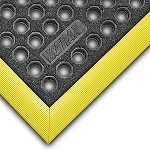 Is your work environment always getting wet and full of debris causing accidents that end up costing the company lots of money? 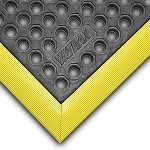 Now is the time to protect your workers with floor mats that will reduce accidents and increase performance and production. 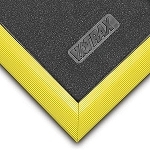 The 856 Niru Cushion-Ease Solid GSII Floor Mat made by NoTrax is specially engineered from 100% Nitrile rubber compound and a silicon carbide grit to make an anti-slip safety mat resistant to industrial chemicals, oils, and greases while reducing muscle and back fatigue due to proper blood circulation for increased productivity. 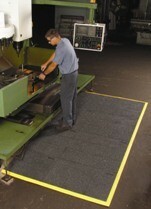 These floor coverings snap together for a fully customized work environment.